Ammenities: TV, Phone, Hot Tub, Sauna, Coffee Shop, Restaurant, Limited Wheelchair Access. 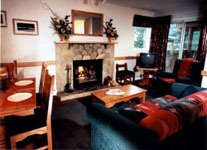 From their website: The Banff Aspen Lodge combines affordable accommodation with warm, friendly hospitality and excellent facilities. 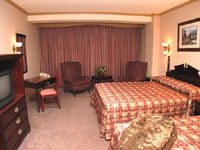 All of our guest rooms are spacious and tastefully decorated. Singles, couples and families can choose the room type that suits their needs; most rooms feature private balconies and mountain views. From its convenient location on Banff Avenue, The Banff Aspen Lodge is just a three-minute stroll to the fine shopping, dining, museums and galleries that make Banff an unforgettable destination in the Canadian Rockies. We are a “Class B” Alberta Heritage Site” consisting of 5 fully furnished, cozy 1 or 2 bedroom cabins, with full bathrooms, microwave kitchenettes and some with living rooms. Located 1⁄2 block from main street and parking at the back. With Continental Breakfast, free high speed wireless internet, smoke free cabins, and children under 10 free. Also no pets are permitted. St. Julien Rd, PO Box 1020, Stn. 15, Banff, AB, T1L 1H5 *Conference Accommodation Only! Ammenities: TV, Phone, Swimming Pool, Hot Tub, Sauna, Coffee Shop, Restaurant, Bar/Lounge, Kitchen Facilities, Fireplaces, Limited Wheelchair Access. From their website: Check out our Inspirational facilities. The Banff Centre offers more than 400 modern guest rooms, as well as over 60 exceptional meeting facilities, lecture theatres, and auditoriums to suit groups from 5 to 1,000 participants. The promise of inspiration. Offering inspiration is our heritage and our future. From internationally acclaimed artists and writers to world famous musicians and mountaineers, The Banff Centre has a long-standing tradition of fostering innovation and new thoughts. Inspiration is what we do here. And it's what we do best. Ammenities: TV, Phone, Hot Tub, Sauna, Restaurant, Fireplaces, Air Conditioning. 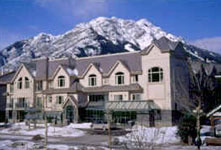 From their website: A true mountain beauty opened in the summer of 1993, and since then the Banff Inn has welcomed numerous guests from around the globe. Located on Banff Ave, only minutes from Restaurants, Shopping and Nightlife, the Inn offers standard and Deluxe Rooms with Jacuzzi Baths, Superb Lofts, and Honeymoon Suites with Fireplaces and Whirlpools. The Banff Inn is ideal for Canadian Rockies vacations, and is one of Banff National Park's premier choices when it comes to mountain lodging. All rooms have individually controlled heating and air-conditioning units, and most have balconies so that guests can enjoy the splendour of the Canadian Rockies from the comfort of their room. Ammenities: Indoor Swimming Pool, Hot Tubs, Full Gym, Massage Therapy, Tennis Courts, Laundry Facilities, Free Internet Access, Complimentary Shuttle to Downtown Banff. From their website: Timeshare-Resale-Rental offers a terrific selection of timeshare rentals at the Banff Rocky Mountain Resort. Offering studio, one and two bedroom vacation suites, this rustic resort is set at the base of Rundle and Cascade Mountains, yet is under 5 km from downtown Banff – providing the perfect combination of seclusion and accessibility for your next escape to the Canadian Rockies. Suites are available in a variety of configurations and many include full kitchens, pull-out sofa beds and gas or wood burning fireplaces for those cozy nights. All of our rental properties are for rent by owner, so prices are negotiable. Ammenities: TV, Phone, Swimming Pool, Hot Tub, Sauna, Restaurant, Bar/Lounge. From their website: Located in Banff National Park, an hour and a half from Calgary International Airport, (take the first exit into Banff). A World Heritage Site in the very heart of the "Canadian Rockies", both Banff Voyager Inn and Spruce Grove Inn are located right on Banff Avenue, and we are a short 10-minute walk from downtown. Away from the "hustle bustle" of downtown, you are able to experience the ambience of the "Canadian Rockies" in all its splendor. Our eighty-eight room Inn offers clean, comfortable accommodation, in a warm, friendly atmosphere for the budget-conscious traveler. Amenities include Outdoor Heated Pool (open year-round), indoor whirlpool and dry sauna, Dining Room, Lounge, Garden Patio (throughout summer), and our Liquor Store. 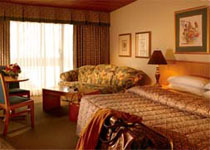 Banff Voyager Inn also offers complimentary covered parking with electrical outlets; complimentary ski lock-up, safety deposit boxes, interior entry and twenty-four hour front desk. All of our rooms feature 2 queen sized beds, private balcony, bath/shower combination, colour cable television, and voice mail. Our front desk staff will be able to assist you for siteseeing, car rental information, local attractions or any additional information on the Banff area, so that your stay with us will be more enjoyable. 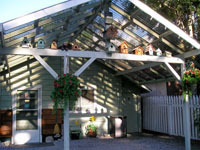 Ammenities: TV, Phone, Swimming Pool, Hot Tub, Kitchen Facilities, Fireplaces, Pets, Air Conditioning, Limited Wheelchair Access. 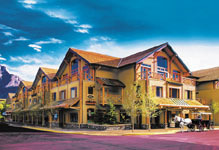 From their website: Welcome to the Best Western Siding 29 Lodge! 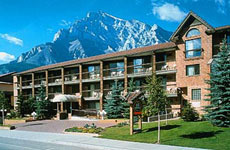 We are conveniently located in the heart of the Canadian Rockies in beautiful Banff, Alberta. Our Banff Hotel is just off Banff Avenue and is within walking distance of downtown. 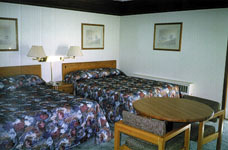 The friendly and helpful staff at Best Western Siding 29 Lodge will be glad to assist you in any way possible. Banff boasts the world-famous ski resorts of Sunshine Village, Lake Louise, and Mount Norquay. Some other activities you will be able to enjoy include cross-country skiing, dogsled rides, mountaineering, fishing, gondola rides, golfing, hiking, horse-drawn carriage rides, and more. Our Best Western in Banff provides easy access to other activities, such as soaking in the Hot Springs and paddling along the Bow River. In the fall of 1883, work gangs of the Canadian Pacific Railway quickly pushed the rail line westward through the valley of the Bow River, establishing among others, a small work camp, "Siding 29". In time, Siding 29 unfolded to the town of "Banff", in Canada's first National Park. Siding 29 remembers the history of Banff. Located just off Banff Avenue and walking distance from downtown, Siding 29 Lodge is a modern counterpart for the "siding" that existed here decades ago. A place for the trains to stop, while others passed through, the area has since been transformed into one of the most versatile and spectacular vacation spots in the world. Ammenities: TV, Phone, Swimming Pool, Hot Tub, Restaurant, Limited Wheelchair Access. 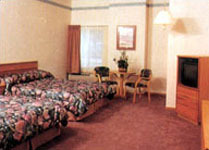 From their website: Bow View Motor Lodge offers a superior experience amongst Banff hotels. We are perfectly located, just two-and-a-half blocks from downtown Banff. Shopping, dining, and entertainment are only a short walk away! 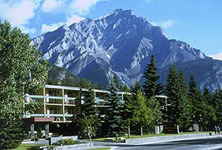 Bow View Motor Lodge is also the only Banff hotel located directly on the Bow River. A tree-lined path will guide you to exceptional views of the mountains that surround us. Bow View Motor Lodge is a family-owned-and-operated Banff hotel, and you will enjoy our friendly service. We also offer a number of amenities and conveniences to make your stay with us a truly enjoyable one! Ammenities: TV, Phone, Hot Tub, Sauna, Restaurant, Bar/Lounge, Limited Wheelchair Access. Ammenities: TV, Phone, Swimming Pool, Hot Tub, Sauna, Kitchen Facilities, Fireplaces, Air Conditioning. From their website: A Banff Favorite For Many Years... Charlton's Cedar Court has undergone extensive renovations. We invite you to check out our new look. The atmosphere is casual and comfortable... a great place for families to unwind after a busy day of mountain activities. Gather around the fireplace in our newly expanded lobby. Catch up with the news back home at the internet station. Or enjoy a refreshing visit to the hotel's indoor pool, whirlpool and steam room. Your room awaits you at the end of the day. Select from romantic Loft Suites, family friendly Kitchenette Suites, and Deluxe Guest Rooms. Plan your perfect retreat in the room of your choice. Ammenities: HDTV flat screens with DVD, Phone, Swimming Pool, Giant indoor kids playzone, Waterslides, kiddie pool, Hot Tub, Sauna, Full kitchens, Fireplaces, Cabins, Fitness room, Limited Wheelchair Access. 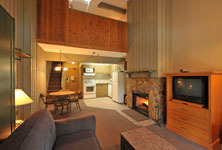 From their website: Douglas Fir Resort & Chalets is Banff's Finest Family Accommodation. Ideally located on peaceful Tunnel Mountain only 4 minutes above downtown Banff, the Resort boasts scenic views of the Canadian Rockies right from your hotel room's private balcony or patio. Unique accommodations include newly renovated condos, chalets, specialty suites and NEW 3 bedroom (4 bathroom) family suites for up to 10 people! All units have full kitchen, air-conditioning and fireplace (most are wood-burning). 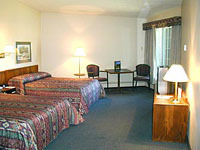 NEW in all of our rooms are flat-screen TV's and DVD players! It is easy for families to bring all of their electronic gaming systems (wii, Xbox, PS2 etc. ), with our NEW Plug and Play easy connect panel in the living room (don't forget to bring your connector cables and favorite DVD's). Families love our two giant indoor waterslides, swimming pool, kiddie pool, games room and popular multilevel indoor playzone. Relax in our saunas, whirlpools and steam room or enjoy unlimited access to our fitness room, outdoor tennis/basketball courts, outdoor playground and barbecue stations. Registered guests of the Douglas Fir Resort enjoy FREE AND UNLIMITED use of the Town of Banff shuttle bus system. Ammenities: TV, Phone, Swimming Pool, Hot Tub, Sauna, Restaurant, Kitchen Facilities, Air Conditioning, Limited Wheelchair Access. 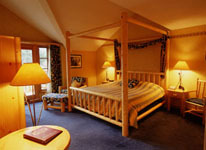 From their website: The Banff High Country Inn is located in the heart of Banff, Canada. 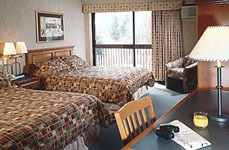 Our guest rooms are spacious and comfortable, and boast views of Cascade, Sulphur, or Tunnel Mountain! You will find our location convenient, as our Banff hotel is only two blocks from downtown's shopping and restaurants. After a long day of skiing or sightseeing around Banff, Canada, you will enjoy a dip in our indoor pool, or relaxing in our hot tub or sauna. If you aren't sure where to start with things to do, talk to our staff at the front desk. At the Banff High Country Inn, we are happy to help you book tours or activities. Ammenities: TV, Phone, Hot Tub, Sauna, Restaurant, Limited Wheelchair Access. 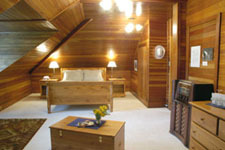 From their website: Irwin’s Mountain Inn offers a wide variety of room types ranging from affordable standard hotel rooms through to more luxurious deluxe suites that offer jacuzzi tubs, separate bedrooms, and/or fridges and microwaves. Some rooms sleep up to six people and are ideal for family vacations or two couples travelling together. If you plan to make a reservation , whatever your accommodation needs may be, Irwin’s Mountain Inn can provide you with a number of hotel alternatives to choose from that will make your stay in Banff a pleasurable one. Banff National Park is one of Canada’s oldest and is nestled in the Canadian Rocky Mountains. Less than an hour’s drive from Calgary, Alberta, the park was established over one hundred years ago to preserve its rugged, pristine beauty. Originally, royalty and the wealthy comprised the core of visitors who came, but today people from all walks of life and from all parts of the world are able to visit Banff National Park. Banff is the place to be if you are making plans to visit Banff National Park. Picturesquely located in the Rockies, this world renowned destination provides you sensational sightseeing opportunities, interaction with wildlife, museums telling of Banff’s past, a variety of recreational activities, unlimited dining opportunities, and a potpourri of retail shops and galleries. 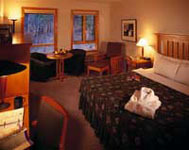 And for your convenience, just a few minutes walk from downtown Banff, Irwin’s Mountain Inn provides you the comfort and luxury you would expect from one of Banff’s premier accommodations or hotels. 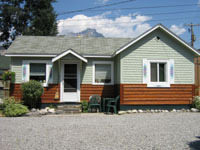 From their website: The Riverside Bed & Breakfast is situated on the quiet Bow Avenue in Banff, Alberta. Which, of course, is located in the spectacular serene Canadian Rockies. We pride ourselves on the warmth of our welcome, the great food we serve and affordable accommodations. All this in cozy surroundings with a convenient location too! This charming old Banff heritage home is centrally located 1 1⁄2 blocks from downtown and across the street from the peaceful Bow River. You can pick up a hiking trail easily from the front of the Bed & Breakfast and walk on trails all the way to the Cave and Basin or Bow Falls, and those trails branch off to all sorts of other interesting places. It would make an excellent "home base" for any visitor interested in exploring the unspoiled scenery of Banff on foot. 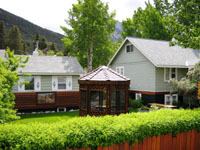 The Riverside Bed & Breakfast is only one block away from downtown Banff, with many options for shopping and dining. 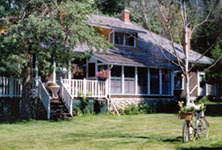 Other attractions close to the Bed & Breakfast are the Bow River Recreation Area and the Luxton Museum. Your stay with us will be enjoyable and memorable. Come home to the Riverside Bed & Breakfast! Ammenities: TV, Phone, Swimming Pool, Hot Tub, Restaurant, Bar/Lounge, Kitchen Facilities, Fireplaces, Air Conditioning. 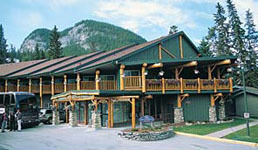 From their website: Welcome to the Rundlestone Lodge, here in Banff National Park and the Canadian Rockies. We have a lovely property with great features, which could make your visit to the Rockies something really special. The hotel's architecture of sloped roofs, logs, and rundle rock signal the romantic appeal of a mountain lodge. On entering the Lodge, guests of the Rundlestone enjoy a warm quiet interior design, reminiscent of what one might have experienced in a quality mountain hotel of the 1920's. A large stone fireplace, soft furniture, rich colors, and a registration desk cut from logs 24 inches in diameter will have your mind wandering far away from everyday life. The gracious Restaurant presents a delightful all Canadian menu as developed by Swiss Chefs Wesley Hope and Laura Hope. Recipes for soups, appetizers, entrees, and deserts have been based on fruits, vegetables and meats- all considered to be natural to Canada. Casual conversation with a friend in the Parlor is embellished with a glass of one of the many vintages of fine Canadian wine. Baker Hall provides a private dining or meeting area for up to 70 of your friends or business colleagues. Our Health Club will allow you to release tension and achieve the calm and serenity you have been trying so hard to find. We have top quality exercise equipment, a 13 meter (45 foot) lap pool and an eight person jacuzzi, all on the second floor. At one end of the facility we have an outdoor sun deck with lounge chairs which overlook the park next door. And our Rooms - which provide 22 different styles- will allow you to linger into sleep, dreaming about the majesty of the mountains and valleys of the Rockies, satisfied you made the right choice in selecting the Rundlestone Lodge. Ammenities: TV, Phone, Swimming Pool, Hot Tub, Sauna, Restaurant, Bar/Lounge, Fireplaces, Air Conditioning, Limited Wheelchair Access. From their website: Located in Banff National Park, an hour and a half from Calgary International Airport, (take the first exit into Banff). A World Heritage Site in the very heart of the "Canadian Rockies", both Banff Voyager Inn and Spruce Grove Inn are located right on Banff Avenue, and we are a short 10-minute walk from downtown. Away from the "hustle bustle" of downtown, you are able to experience the ambience of the "Canadian Rockies" in all its splendor. 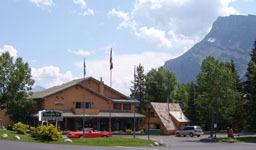 Banff's newest inn opened May 4, 2002. With a rustic log façade against a backdrop of Cascade Mountain, Spruce Grove Inn offers affordable luxury at its finest. Eighty-nine rooms, the majority of which have twin queen-sized beds, (Single King and handicapped rooms also available) featuring individual heat and air conditioning, coffee/tea makers, hairdryers, custom furnishings, bath/shower combination, 27" colour cable television, and voice mail. Over eighty-five percent of our rooms are non-smoking. 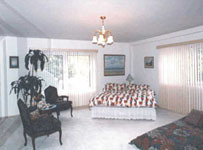 Four Loft Suites available, ideal for the travelling family, honeymooners, and other "special occasions". Our Loft Suites have 2 levels, with a living room, mini-fridge and microwave, bathroom and sofa bed comprising the main floor; as well as the bedroom and another bathroom on the second level. 3 of our Loft Suites also have spacious Jacuzzis. Complimentary heated underground parking and complimentary in-house ski lock-up. Full access to all of Banff Voyager Inn's amenities including outdoor heated pool (open year-round), indoor whirlpool and dry sauna, dining room, lounge and garden patio (in summer). 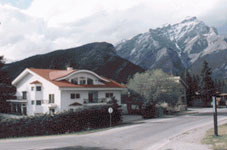 Spruce Grove Inn is interconnected to Banff Voyager Inn via underground walkway. Express Check-Out is available. Our front desk staff will be able to assist you for siteseeing, car rental information, local attractions or any additional information on the Banff area, so that your stay with us will be more enjoyable. From their website: For the cost conscious traveller, Swiss Village is the perfect spot. 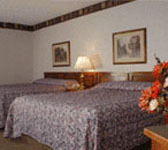 Bedrooms in this deluxe motel are tastefully decorated and have satellite television, telephones, radio, hairdryer, coffee maker, and either two double beds or one queen bed. 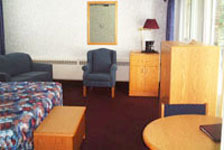 Guests are welcome to use the amenities of the Inns, located next door. From their website: Tarry-a-while was the Banff home of Mary Schäffer, one the Canadian Rockies' most notable woman explorers. Built in 1912 using high-quality local materials in a cottage-style belying its size, it stands today as one of Banff's most important heritage homes, still offering the comfort and convenience for which it has become famous. *Bed & Breakfast* - *Hotel Garni* - *Hotel Particulier*. Private Hotel - Type - Spa - Large indoor pool, elegant home base for relaxation and excursions. Quiet central location, and Canada Select 5 Star Rated.Choose your favorite activity from a list including golf, skiing, hiking, biking, fishing, antiquing,site seeing, or just plain relaxing. Combine a luxurious romantic place, with surrounding breath taking mountains. Whether it's a summer or winter vacation to the mountains of Banff National Park, or a fall foliage weekend for vista's that have to be seen to be believed, the Treutler Family Bed & Breakfast is a 5 Star destination. Your Hostess & Host, Freya and Ossi Treutler, will be happy to help you discover Banff and the surrounding area and get the most out of your visit. Take some time to browse our web site. We have designed our web site to be quick loading and convenient to use. At the left hand side of each page you will find a navigation bar that will allow you to quickly obtain information about the Treutler's Resort Bed & Breakfast. In addition to visiting each room, you can also check out our room rates. At the bottom of each page, you will also find an additional navigation bar to help you contact us for further information, or get directions to the Bed & Breakfast. Ammenities: TV, Phone, Swimming Pool, Hot Tub, Sauna, Kitchen Facilities, Fireplaces, Cabins, Air Conditioning.